KCM Raises Nearly $65,000 at the “Swing from the Heart” Golf Tournament! 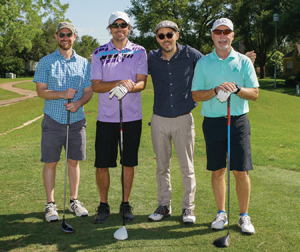 Beau Brotherton, Wayne Kerr, Nolan Burke and Bob Button play for the Grace Fellowship team at the 2018 KCM Golf Tournament. Photo by Amazing Images Photography. A total of $64,800 was raised for the Katy Christian Ministries (KCM) to perform critical, life transforming work in the Katy/West Houston community. Katy Christian Ministries serves 12 local zip codes, providing emergency assistance to families and individuals who find themselves in crisis or financial difficulty. These services include flood relief assistance, rental and utility assistance, a long list of critical services for victims of domestic and sexual violence and a Food Pantry for those needing supplemental food and personal care items. Seasonal programs like Red Apple School Supplies and Santa’s Sleigh help families provide extra school materials and Christmas gifts to their children when the money just isn’t there. One hundred and twenty-two golfers turned out to support KCM and enjoy a beautiful day of golf and fellowship for a great cause. Located at Weston Lakes Golf Course, golfers enjoyed grilled burgers, silent auctions, a raffle for a 65” Smart TV, a steak dinner and awards for the tournament winners. For more information about KCM, visit www.ktcm.org.